Yesterday, Apple CEO Tim Cook was interviewed by CNBC's Jim Cramer. During the conversation, the topic of Apple's legal issues with Qualcomm was brought up. Besides discussing Qualcomm's reluctance to license its standards essential patents in a "Fair, Reasonable and Non-Discriminatory" (FRAND) manner, Cook called Qualcomm's licensing fees "exorbitant." He also said that Apple and Qualcomm haven't been in any settlement talks since the third calendar quarter of last year. According to Reuters, Qualcomm responded today by calling Cook's comments about the settlement talks "misleading," stating that Apple's CEO incorrectly interpreted comments made by Qualcomm's CEO,Steve Mollenkopf (seen in image at the top of this article) back in November. Ironically, Mollenkopf was speaking with Jim Cramer when he said that Qualcomm and Apple were close to resolving the differences between the two firms. 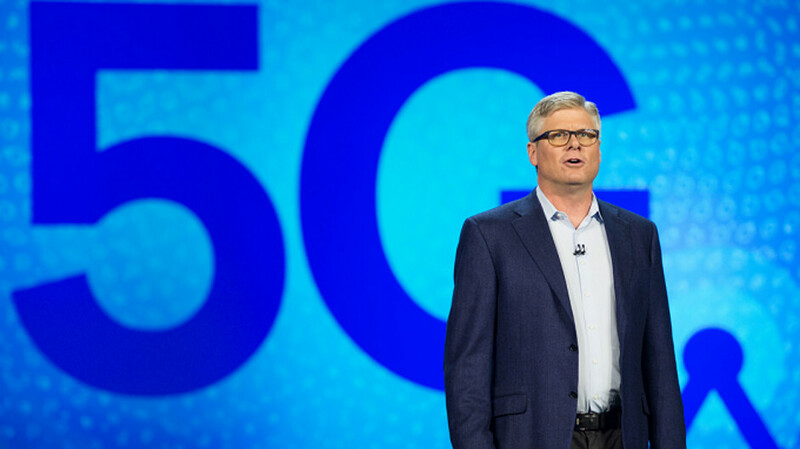 Qualcomm's chief executive said "We do talk as companies, and I think what you’re seeing, really, are activities consistent, really, with the fourth quarter of the game, and not the first quarter." Mollenkopf's statements seem to contradict Cook's comments. Qualcomm says that its CEO's statement is accurate. Apple and Qualcomm will kick off their legal battles in court starting in April. While Apple accuses Qualcomm of various wrong doings related to its patent licensing activities, Qualcomm accuses Apple of owing it as much as $7 billion in unpaid royalties. Currently, Qualcomm is in court facing antitrust charges from the FTC, also related to how it licenses it patents. Today is the fourth day of a 10 day non-jury trial. If Judge Lucy Koh rules in favor of the FTC, Qualcomm could be forced to change the way it does business with smartphone manufacturers. QC losing this is a huge win for consumers. This would just mean that any company that breaks laws is punished. Apple will get its due punishments for stealing others intellectual property and not paying licensing fees. For haters who are going to argue that Apple is a hypocrite for talking about fee: - Apple has not signed any FRAND aggrement amd hence can charge whatever they want. - QC on the other hand is breaking FRAND aggrements blatantly. - Apple’s high prices have already damaged the company so Apple is really not escaping with anything. First of all, QC hasn't broken any FRAND agreements, Apple is trying to force them to license based on FRAND for things they agreed to license not based on FRAND. Apple is literally the Trump of the tech industry. Second, QC losing this lawsuit is a huge loss for consumers because that means Apple can continue crippling small companies and patent trolling bigger ones into doing their bidding. Now the FTC lawsuit, that is a different story. QC definitely needs to lose that one, but only after they beat Apple. That situation would be a win for consumers the world over. Do you know that QC cannot charge whatever they want, when under FRAND agreement. Did you not read Lenovo's statement PA published 2 days back where companies who do not accept their terms do not chips on time. I know your next question: - Why did Apple accept their terms before? Ans: Just like Lenovo's statement. Every manufacturer , including yours truly Apple needed to accept their terms to get chips in time. Finally Intel is available to everyone including Apple to challenge QC while not getting their business affected. If you were Apple CEO, you are saying you would rather not accept terms and ruin your business? "QC losing this is a huge win for consumers" Even if QC do lose the case do you really think it's a win for consumers? Do you honestly think Apple would reduce the price of an iPhone?, Apple would just see this as an increase to revenue, consumers would never see a price drop or a single penny of those savings. Same goes for other OEM's. You are living in a dreamworld. Apple! Bow down, and get those real modems back in the iPhones. Wallets are now speaking. It is plain simple, fruit company signed a legal contract with QC so they agreed with everything! Just pay the money, fruit company should be banned because they are misbehaving, they cheat, lie and steal! When you sell the same item to poor and rich people, do you charge more to rich people? Oh no! That made zero sense. They signed the deal, so pay up.